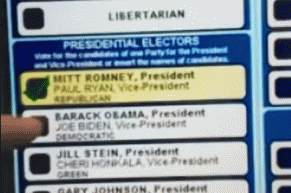 I initially selected Obama but Romney was highlighted. I assumed it was being picky so I deselected Romney and tried Obama again, this time more carefully, and still got Romney. Being a software developer, I immediately went into troubleshoot mode. I first thought the calibration was off and tried selecting Jill Stein to actually highlight Obama. Nope. Jill Stein was selected just fine. Next I deselected her and started at the top of Romney's name and started tapping very closely together to find the 'active areas'. 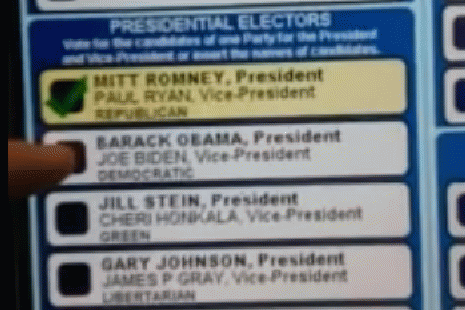 From the top of Romney's button down to the bottom of the black checkbox beside Obama's name was all active for Romney. From the bottom of that same checkbox to the bottom of the Obama button (basically a small white sliver) is what let me choose Obama. Stein's button was fine. All other buttons worked fine. On Reddit, over 37,000 people have voted down the report of the vote flipping, out of about 42,000, at this time. They do this so it will not show up as among the top stories. Commenters are saying that it is due to a calibration error. They are also offering the Brooklyn Bridge for sale. View All 6 Articles in "Voting"